Observation - Female Sparrowhawk (maybe) - UK and Ireland. 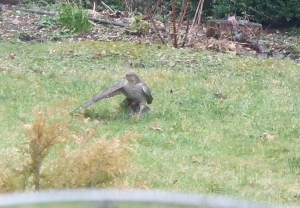 Description: This bird (possibly a sparrowhawk) was seen plucking a small dark bird on my lawn. Poor photograph, I know, but I wanted to have a record of it before it flew away. This bird (possibly a sparrowhawk) was seen plucking a small dark bird on my lawn. Poor photograph, I know, but I wanted to have a record of it before it flew away.